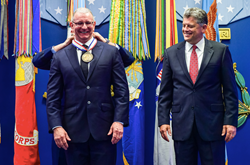 Chef Robert Irvine has been named as this year’s Spirit of Hope Award winner by the Office of the Secretary of Defense. Chef Robert Irvine has been named as this year’s Spirit of Hope Award winner by the Office of the Secretary of Defense. The honor recognizes those who go above and beyond to provide aid to those who serve our country. Chef Irvine, a former member of the British Royal Navy, is a world-class chef and TV personality. In 2014, he founded the Robert Irvine Foundation to support veterans and veteran causes in need of assistance. The Foundation works to help those individuals and organizations that are committed to enriching the lives of military personnel (active, retired and veterans) and their families. A portion of proceeds from Robert Irvine Foods are given to the foundation in addition to public donations. Multiple times through the year, Chef Irvine can be found attending troop rallies held by the Gary Sinise Foundation as well as touring regularly with the USO. Maximizing his culinary skills, he visits with service members and their families while dishing up fine cuisine and providing cooking classes. Along with Chef Irvine, three other people and two organizations were awarded for their military involvement during a special ceremony held inside the Hall of Heroes at the Pentagon on October 26th. Each recipient received a bronze medal, bearing the face of legendary actor and comedian, Bob Hope, for whom the award is named after. Hope spent close to 60 years providing entertainment to troops around the world, on behalf of the USO. Currently, more than 82,000 troops are deployed worldwide.